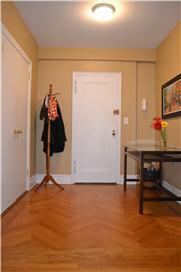 Spectacular Prewar Large One Bedroom! Quiet and flooded with light, this rarely available "G-line" corner apartment with double open exposures offers a functional layout with a gracious entry foyer, a separate dining area, and a renovated kitchen and bathroom. There are gorgeous herringbone floors throughout, beamed ceilings, as well as each room having new oversized Tilt-n-Turn windows. The modern convenience of through-the-wall air conditioning, an abundant amount of closets, and open views, easily makes this apartment a place thatÂll make you feel at home.